I think I may have died and gone to heaven ... if heaven is lusciously rose-scented, that is. Because the new Givenchy Gloss Poetique Color-Enhancer Lip Gloss in Poetique Rose has definitely made me swoon. 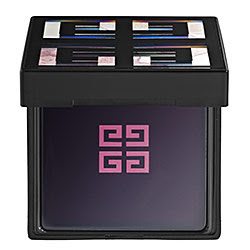 For starters, the packaging is G-O-R-G-E-O-U-S. A black lacquered compact with the signature Givenchy logo -- with a rose motif behind it, natch -- opens to reveal what at first looks like a black gloss over another Givenchy logo. But once you swirl your finger in (or open up the bottom part of the compact to reveal three different lip brushes, if you're wary of the germs and bacteria that can come from pot glosses), you'll find that it's actually a pale gloss that goes on sheer and turns to the most beautiful subtle pink. It leaves behind the prettiest pale flush and gives off that "I just kissed a boy behind the bleachers and I know I shouldn't have but it was just so much fun!" kind of look. Best of all, the gloss is delightfully thick, rich and lush without feeling sticky or tacky. Plus it leaves behind the most unbelievable rose scent! Givenchy Gloss Poetique Color-Enhancer Lip Gloss in Poetique Rose was part of Givenchy's Les Poetiques Collection for 2009. Unfortunately, it is no longer available.